W. W. Norton & Company, 9780393316735, 288pp. In the "old" Gilded Age, the barons of business accumulated vast wealth and influence from their railroads, steel mills, and banks. But today it is culture that stands at the heart of the American enterprise, mass entertainment the economic dynamo that brings the public into the consuming fold and consolidates the power of business over the American mind. 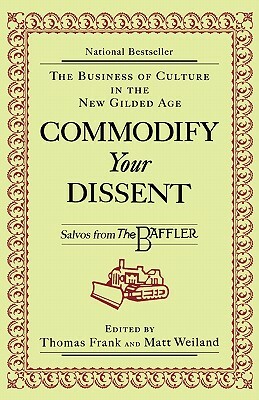 For a decade The Baffler has been the invigorating voice of dissent against these developments, in the grand tradition of the muckrakers and The American Mercury. This collection gathers the best of its writing to explore such peculiar developments as the birth of the rebel hero as consumer in the pages of Wired and Details; the ever-accelerating race to market youth culture; the rise of new business gurus like Tom Peters and the fad for Hobbesian corporate "reengineering"; and the encroachment of advertising and commercial enterprise into every last nook and cranny of American life. With its liberating attitude and cant-free intelligence, this book is a powerful polemic against the designs of the culture business on us all.